Make the most of in season produce with this delicious Strawberry and Red Wine recipe from Kevin Dundon. Wash and hull strawberries and cut into quarters. Combine the red wine and sugar in a saucepan and add the vanilla pod. Bring to the boil, then reduce to a simmer for 4–5 minutes. Remove from the heat and discard the vanilla pod, allow to cool. 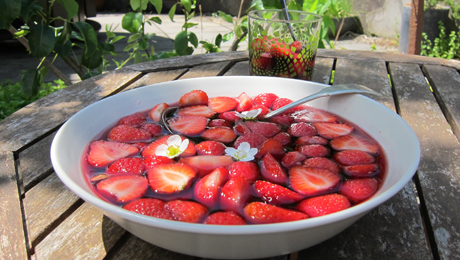 Once cooled, add the strawberries and allow to marinate in the soup for about 30 minutes to allow the flavours to infuse. Serve chilled with some crushed ice or at room temperature.